Mountain Biking in the local trails in my Southern California home has kept me both reasonably fit while maintaining a close connection with nature. As you roll through many of the trails here, the terrain varies significantly…from the darker shadows of the canyon floors to the wide-open sun exposed ridge-top fire roads. And with these changes there are noticeable variations in the temperature and moisture in the air. Wouldn’t it be interesting to track these variations as the trail climbs up the mountain face and descends down the other side? Sure, there are gadgets available that do this kind of thing. Like tracking your position, speed, altitude and heart-rate. If you really look around, you might even find one that reports the temperature. Not cheap, but they are available. Hmmm… Let’s see, can we make a do-it-yourself alternate? A solution that is much cheaper than the cost of a commercially bought product? This looked like a perfect task for the super low-cost ESP8266 and a few inexpensive sensors. Coupled with a data link to a smartphone, you got a mobile platform tailored to track just about anything. A system that can be tailored to your exact needs. All at a fraction of the cost of a commercially available product, if you can find one meeting the specifications you want. My initial design simply collects data samples and saves them to a file on my Android SD Card. This file is then transferred to a PC for visual representation with excel. Later, I intend to add screens to the Android App to display the data on phone. But first, a data collection and storage system was needed. After thinking about how I wanted to implement these features, the project was broken down into several phases. This post addresses phase 1. Yep, this project is “work-in-progress” and phase 1 is as far as I have gotten…so far. Check back to this blog soon for updates that cover the subsequent elements of this Application as they are developed. Once completed, the “phases” that following will be turned into links. The smartphone App is obviously the heart of this project. In this first phase, it must gather data from 3 different sources. But that’s not the only thing to consider. Aside from the Smartphone App, the project also uses an external micro-controller. So the hardware and software design of the ESP8266 system also needs to be developed. But let’s start with the Smartphone App and it’s 3 sources of data. But how do we do it? What do the hardware and software components look like to make this a reality? My first thought was to add a GPS sensor as an ESP8266 sensor input. But then the obvious hit me… The Smartphone has a built-in GPS Sensor. 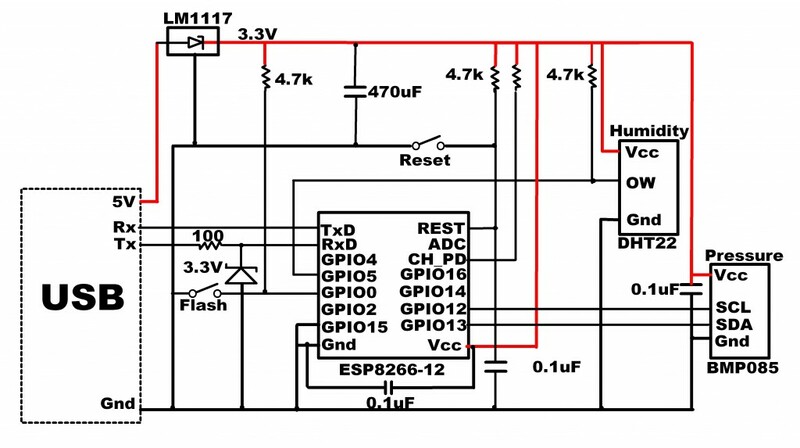 Why not use it instead of added a redundant capability to the ESP8266 system? The “options” structure sets the GPS configuration. The “enableHighAccuracy” field must be set to true. This tells the geolocation API to use the phones GPS Sensor. If it is set to false, the API will use the 4G or WIFI connection to determine location. Believe me, you do not want that active, it is very slow. It also will not work on the trail when you are out of cell tower range. The timeout is set to 1 second, setting the maximum time to acquire a location from the GPS sensor. Finally, the maximumAge sets the time to use a cached value before acquiring a new location from the sensor. Setting this to zero forces a new acquisition every time a position change is detected. Once the Cordova web-based App page (index.html) has been loaded, the geolocation “watchPosition” callback is registered. Subsequently, every time the phones’ GPS sensor detects a change in position, the “onSuccess” callback function is executed. The “onError” callback is run if an error is detected. You can do anything you want with the data in the “onSuccess” callback. 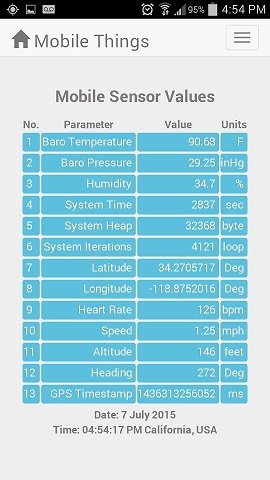 This example simply displays the values on the App window by setting the html for the objects by id to the GPS Sensor measured value. As noted, the next phase of this project will log these values to an SD card file on the Smartphone. The last line of the “onSuccess” callback executes the function “updateWeatherSensorData”. The updateWeatherSensorData() function makes an AJAX request to the ESP8266 to return the current sensor values and status in JSON format. Just as with the GPS Sensor data, these values are simply used to set the html for the applicable displayed objects by id. A placeholder has been set in the code to collect heart rate monitor sensor data. While I have used Apps that interface with an external heart rate monitor using ANT+ and therefore know it is possible, I have have not accessed this interface in my own App…yet. So, not to hold up the initial release of this project, the Heart Rate Monitor data is planned to be added in Phase 5 using the ANT+ for Android API. The ESP8266 code for this project is very straight-forward. It consists of a simple web server, with the module operating in access point (AP) mode. The SSID has a fixed value of “ESP8266N4” and responds to the hard-coded IP: 192.168.22.1 on port 9703. These, of course, can be set to any value or even configured at run-time through the serial or initial web server default value. However, this example sticks with the hard-coded values since this system will only be paired with a single Smartphone. The web server responds to a request for sensor values and status with a JSON string that can be easily parsed with an AJAX call. The code is based on the IoT_Demo example included in the EspressIf SDK. This project uses SDK Version 1.1.1. The latest version as of this post (1.2.0) should also work but I have not tested it with my code yet. The ESP8266 source code for Phase I of this project is available on GitHub here. The current App GUI display for Phase I of this project exhibits 13 values. This GUI includes CSS styling which takes advantage of the responsiveness of bootstrap. The source code for Phase I of this project is available on GitHub here. Once the ESP8266 schematic has been built and the SDK based code has been installed, the ESP8266 is ready. The Android Application should also be installed on the target SmartPhone. 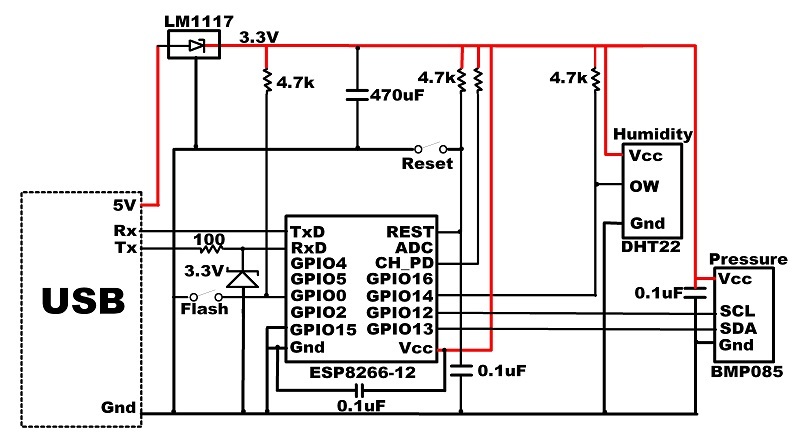 First, power up the ESP8266 from a 5 VDC source. The schematic includes a 5V to 3.3V converter, so I typically use a USB wall source or portable battery. Then you go to the phones WIFI configuration screen and select the ESP8266, which has an SSID of “ESP8266N4” in this example. This will connect the SmartPhone to the ESP8266 so sensor data can be read on demand. Now start up the Android App. The data will update live, typically at a rate of at least once every second. Go ahead, walk around with the phone and observe the GPS Lat and Long values change. You can also put a finger on the barometric pressure sensor and see a change in the temperature value reported on the display. One final note: While this example uses an Android phone, the Cordova platform used is largely platform independent. While I am not familiar with iOS development, it should be a relatively simple task to adapt this application to work with an iPhone with little or no change to the code.